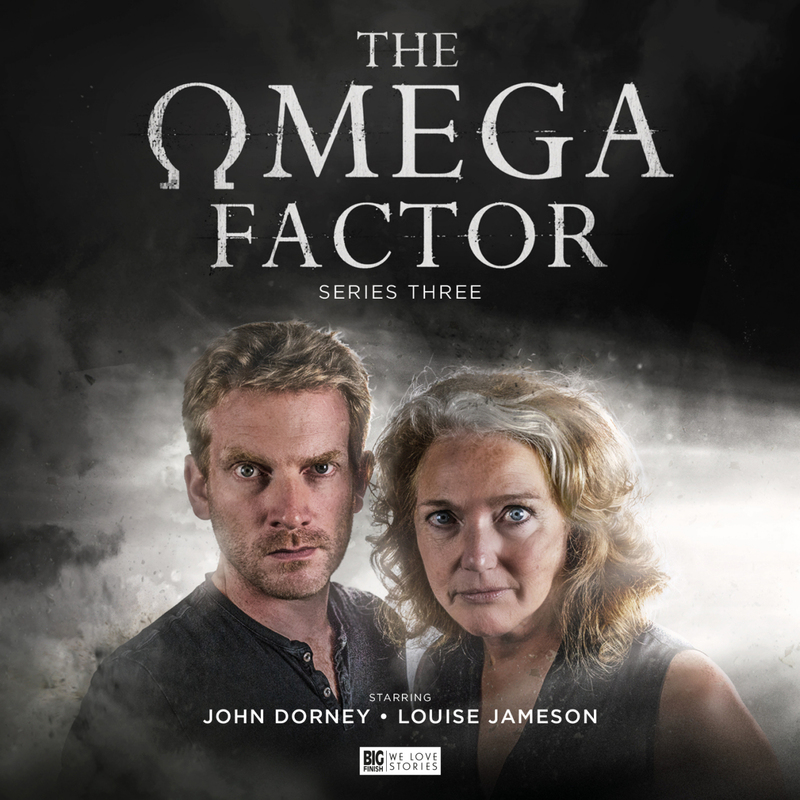 Three series in, and with an episode tally now exceeding the original television run, Big Finish’s continuation of the 1970’s supernatural thriller series The Omega Factor is on robust form. Following the present day investigations of Department 7, the Glasgow based research team is led Dr Anne Reynolds (star of the original Louise Jameson), and this continuation has added John Dorney playing Adam Crane, son of the original’s Tom and inheritor of his abilities. Unbeknownst to them, at the end of the last series, the Department’s Whitehall boss James Doyle (Alan Cox) was been taken over by an agent of Omega; the shadowy cabal who seek to use supernatural powers to assert their authority. Consequently, there is a sinister background to their investigations and if that is not enough, their old nemesis Drexel is back on the scene too. Also returning is Natasha Gerson as Morag, Drexel’s puppet who remains in a coma state; but able to reach out telepathically to Adam with cryptic prompts. Returning after his impressive story ‘The Changeling’ from Series 2, Roy Gill begins the box set with Adam seemingly in a stable place, in a relationship with the girl next door (or rather the flat upstairs), art history student Claire McTeal (Lucy Goldie). While Claire is made an offer she cannot refuse as she researches local experimental photography, Morag is plaguing Adam through dreams and visions about shattering glass and things trapped becoming free. An evening reception to launch Claire’s new find offers a first meeting between her and Anne Reynolds, but ends in murder as the photograph’s former owner Olivia Kirkland (Roberta Taylor) is found dead. A twisted cautionary tale on the subject of good fortune; this is a fantastic start to the set drawing on real Edinburgh history through photographers Hill and Adamson, as well as a Robert Louis Stephenson short story. In her first script for the series, Natasha Gerson relocates the action to Glasgow when Anne and Adam are despatched by Doyle to look into problems on a University course. With a connection to Anne’s past; the course in question is run by an old acquaintance, Professor Peter Shand (Jamie Newall) whose popular lectures are highly oversubscribed while his top-flight students are dropping like flies. The story takes the show into new territory as a connection is made between online gaming and dark forces, and the script neatly contrasts the age discrepancy between the two leads; Adam’s head is squarely in a computer game while Anne’s preference is for classical music and she boggles at his addictive behaviour. Anne is also more tolerant of the fusty Shand, and there is the hint of some affection; while Adam seems to make a connection with Shand’s vulnerable but brave student Lucy (Miranda Keeling) and he seems keen to play the hero. While Adam returns from a trip to Disneyland, making a concerted effort to reconnect with his estranged family, Doyle gifts Anne an incredibly valuable test subject; an illegal immigrant, Adhara Rahul, who exhibits extraordinary powers of levitation and appears to be pregnant too – although she says this is impossible. With pressure being brought to bear by Doyle for results, events take an incredibly dark turn as Adam agrees to help Adhara, at Morag’s insistence, who is petrified of her unborn child. Meanwhile Anne, pushed by Doyle, seems blinded by her subject’s evident powers and unfolding potential. Writing for the series for the second time, Louise Jameson provides a sensitive and deeply unsettling tale which puts the spotlight on Anne Reynolds and her thirst for knowledge, and sets her against Adam who has genuine concerns for Adhara and her plight – as well as Department 7’s plans for her. John Dorney and Orion Ben (Detectorists), who plays Adhara, are both compelling in their conflicted emotions as the horror unfolds and Adam finds himself in the thrall of something truly terrifying. Of the four stories in the set, I found this to be the scariest and most involving. Building on the tensions of the previous story, Adam’s issues with Department 7 come to a head when they come to the aid of a fellow university employee. Grace Roberts (Elizabeth Payne) has been blacking out and then waking to find herself filthy, having collected glass bottles of dubious treasure such as organic matter and animal bones. Meanwhile Drexel; who now inhabits the body of Edward Milton (Gunnar Cauthery), is back on the scene and claiming to be more powerful than ever. He senses a dark power rising, one which is tied to a house being renovated and a buried secret, and he seeks to turn to his advantage. Phil Mulryne’s story provides a strong finale to the series, taking a look at the beginning of Omega and tying up the tensions between the lead characters, both light and dark. I also enjoyed the parallels between Anne Reynolds and Grace Roberts, both women who have seemingly allowed work to consume their lives. While the first two episodes are fairly self-contained, regular investigations for Department 7, the latter pair build on the climatic events of Series Two with the resurgence of Omega and their quest for survival. Smartly directed and scripted, the stories are varied in tone with some relying on sinister threat and implication, while others present out-and-out demonic nastiness. In both cases, they are not for the faint-hearted and it is all too easy to be swept up in the drama, backed by the immersive sound design and unsettling music (Steve Foxon / Nicholas Briggs). Both Louise Jameson and John Dorney seem incredibly at home in these roles and you feel a genuine warmth between their characters; Anne remains work focussed; although not uncaring for the most part, while Adam is still impulsive and seems far more at home with his powers now. That said, there is an undercurrent of tension which builds between them though the four stories and leads to the finale in a very satisfying way. Luckily after that finale, which might have served as an end point to the show, the CD extras indicate that we can expect a Series 4 in due course. Let’s hope we do not have to wait too long though, as the in-story hints suggest that things might be quite different for Department 7 next time around – and all of the central character’s futures have been left rather open to question! While we are waiting, I’m happy to give this series a terrifying 9 out of 10. NB: In lieu of that fourth series, it is worth mentioning that Big Finish are also publishing a novel, The Omega Factor: Spider’s Web this month in multiple formats, including an audiobook version read by Louise Jameson. Also, their audiobook range now holds four of series creator Jack Geshon’s novels, as well as his novelisation of The Omega Factor TV series.